This season I got to chase with two different tour companies back-to-back: Silver Lining Tours and then Weather Adventures. My tour with Silver Lining Tours was a 6 day tour that started on May 26th. The weather on our tour played along quite well (with a few disappointing busts) and we were able to chase 5 days out of 6. We managed to see the Cope, CO, tornado outbreak which was the highlight of this season for me and we also had a great day in Waynoka, OK, with a 10 hour supercell. Silver Lining Tours is, as far as I understand, the largest storm chasing tour company in the industry and I believe it is the one who has served the most tour guests over the years (over 2.000). I have been interested in going with Silver Lining Tours for quite a while for that reason but haven’t had the chance until now. Silver Lining Tours is run by Roger Hill who is the main tour guide. He is one of the most experienced storm chasers around and holds the Guiness World Record of “Most tornadoes seen”. I believe it is safe to say he is one of the best when it comes to finding a tornado. I never felt like we were taking bad decisions, made mistakes or were lazy in terms of picking targets. Sure, we missed some tornadoes but it did not feel like bad calls. In other words, I felt like we were in very competent hands in terms of finding storms and tornadoes. Roger Hill is also a really nice, likable guy. I have heard nothing but good things about him prior to my tour and when I talked to the other tour guests, during my tour, they all said the same thing: Roger Hill is awesome. I was happy to chase in Rogers van, in the front passenger seat, during the Cope, CO, day and not only had a great chase day because of it but also enjoyed hearing one incredible storm chasing story after another. Roger, and his crew, is also really good at taking care of the crowd, which is not always easy but very important – especially considering the number of tour guests. For example, I never felt that we were late or had to wait for anyone, which I think is part of good leadership and clear instructions. In each van there was also a dedicated driver, all equally friendly and professional. In short, the crew is awesome! I am not sure if it is Roger’s business background but I get the impression he runs his tours as a business owner first and as a storm chaser second, which I think is good thing as the tour feels very professional. An example of this is the Meet and Greet lecture the first night, I personally missed it but heard from several tour guests that it was very, very good. The whole tour just felt very smooth and you always felt well taken care of. Another thing I appreciated was the quality of the hotels we stayed in. I was always very pleased with the hotels we stayed at, one even had a water park (!) which made for a fun morning during our down day. So, there is a good reason why Silver Lining Tours is the largest tour company but that is also the main problem: the size. During a normal tour, SLT chase with three vans but on our tour the Photography Tour also chased with us, as well as an additional rental car. The rental car held some extra guests from, for what I understand, was a booking error that had to be handled and something that was out of the ordinary. All in all, there were five vehicles and some 35-40 guests. That is 35-40 guests that stop at each storm, each restaurant, each gas station, each hotel etc. which makes the tour feel crowded. The crew do, however, a good job in handling the tour guests, limiting the impact of the size so you don’t have to wait for your room key for too long in the evenings etc. Still, the amount of guests does make the tour less pleasurable in my opinion. Three of the vans are on a rotating schedule to make sure everyone gets to chase in each van (and get to chase in the same van as Roger some days). This, however, makes you chase only every third day with the tour guide in your van. The other days you only chase with a driver and no guide in the van at all. As with most storm chasing though, you spend most of the time in the vehicle. When you are not in Roger’s van, this means much of the chase is spent with only bits of information about what is going on. As such, I feel like I become a very passive tour guest that is just delivered to the storm, missing out on some of the excitement build-up that comes by being more involved in the chase. Roger does make updates over the radio network but as there are a lot of other talk going on you don’t really know when to listen for it. So, the information distribution could be a whole lot better from Roger to the tour guests during the chase. I should also mention, since I have been chasing for many years my information need may be different to others. I also brought this up with Roger and he said he would look into it for future tours. I talked with several of the tour guests during the tour to hear what they thought about chasing with Silver Lining Tours. Many were recurring tour guests (some for many years) and they were overall very positive about chasing with SLT. One thing that a few mentioned as a negative was the rental car. It seemed like it caused the entire tour to be overly cautious about hail, at some point taking another route than we would have without it. It became a bit of a talking point and a source of frustration for some. Lastly, Silver Lining Tours use the same Chevrolet (?) vans that many other tours use and they just are not very comfortable. No head rests makes it very difficult to sleep in the van, the lack of back support made my back hurt and there is not much leg room. As I have mentioned earlier, this particular van type is very common and a lot of tour companies use them – I just wish they wouldn’t! I doubt anyone had to sit through an entire tour week in the back of them themselves. So, do I recommend Silver Lining Tours? The answer is undoubtedly yes. 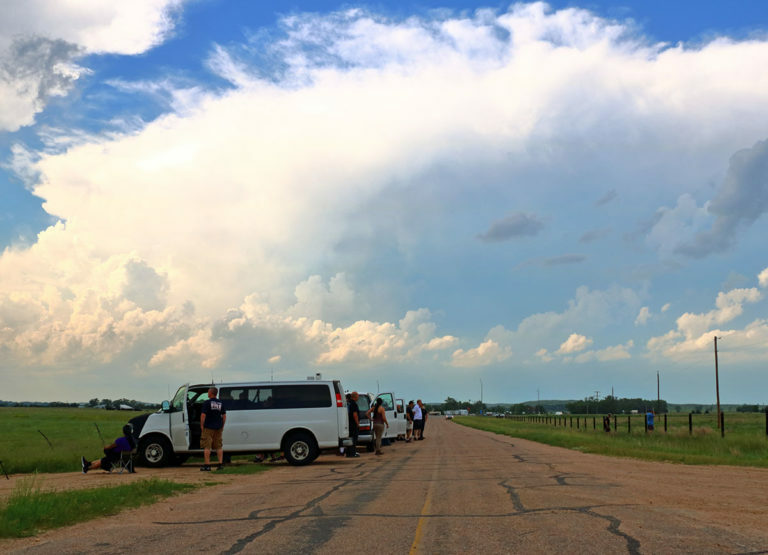 I often state that the most important parts of a storm chasing tour are the tour guide, the vehicle, and the overall handling of the tour as a whole. As mentioned, Roger Hill is an exceptional tour guide and he also has a personality that I think would go well with anyone (on storm chasing tours in general, it could sometimes be a matter of chemistry if you get along with a tour guide or not). The overall handling of the tour is great and very professional: good information prior to the tour, (apparently) a good introduction, and a good briefing every morning. As mentioned, the bad parts are the amount of tour guests, the chase vehicle(s) and the lack of information while in the cars chasing. My impression is that Silver Lining Tours is a very good option if you have never been on a storm chasing tour before – it is a very safe choice if you don’t mind having quite a lot of people around you. You will be well taken care of and the negative parts mentioned may not be very noticeable for you as a first time chaser. I, for one, am very curious about the Close Encounters Tour and the Lecture Tour – who are both chase tours in one van with Roger exclusively. The Photography Tour with Caryn Hill also seems like a very good tour.